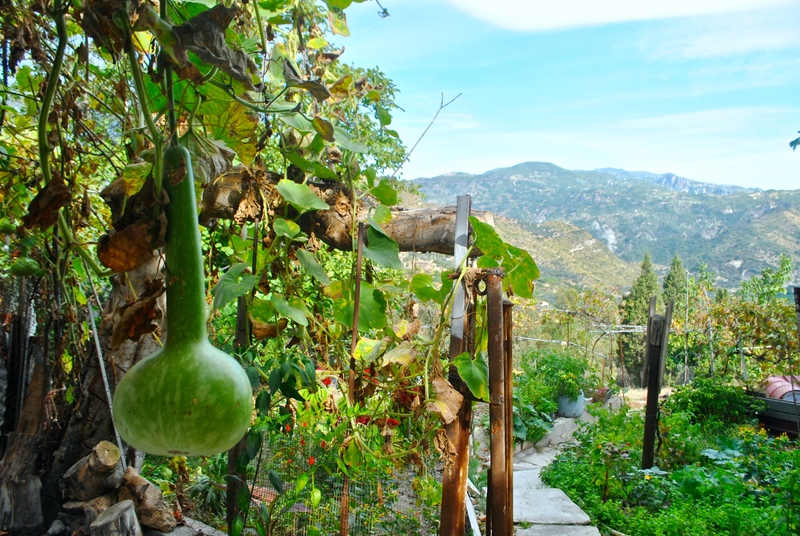 We’re sharing a blog post from our guest blogger team, The Recipe Hunters, of an adventure they had while traveling through Calabria as they searched for authentic, Italian recipes. You can read their original post (and get access to this adventure’s recipes) here. Happy reading (and cooking)! 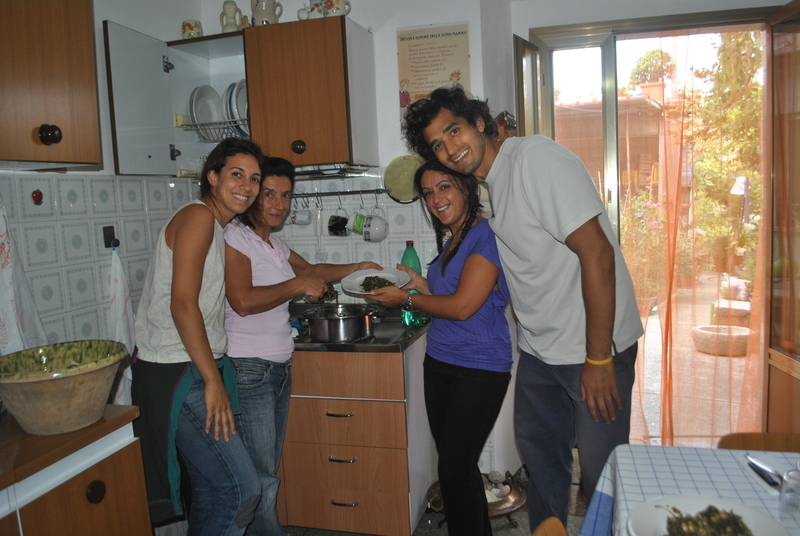 We are staying at Anthony’s family apartment in Marina di Caulonia, in Calabria, Italy. 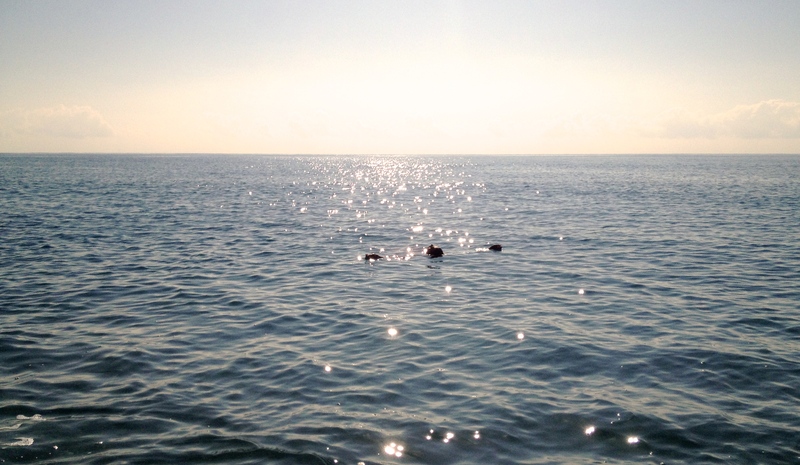 Every morning Anthony wakes up at 6 AM, takes a run and then a swim in the ocean. I lay in bed until I am conscious enough to bribe myself awake with a cup of Italian espresso and hot milk. By the time I get out of bed, Anthony is usually dripping wet, sandy feet, and smiling. We enjoy our morning espresso together practicing Italian before we plug into our computers. We have spent the past five days typing up people’s stories and trying out the recipes we have recorded. I work on the veranda in the mornings where I can hear the fish peddlers and the waves crash against the shore at the end of the street. When the sun gets too hot I retreat inside to the cool fan. We play the local radio station hoping to absorb Italian by auditory osmosis. Yesterday and the day before, the internet did not work, so Anthony and I went into the town looking for kind people to teach us the local, traditional recipes. So far we haven’t had much luck. We spent about two hours yesterday talking to a woman in a herbal shop and I swear I have never heard anyone talk so fast. I could not understand a word she was saying, I felt like my brain was one of those jackpot slot machines that just keeps spinning until it finds a bilingual match. …So off we go to meet the serial killer (well, not really, but my mind tends to wander to dark, scary catastrophic places). We stop to pick up groceries for dinner and after being attacked by a stray spider that crawled up my arm from the chicory (not a good sign), we finally arrive at Aphrodite Campground. At the entrance, Anthony sees a woman in her nightgown smoking a cigarette. We approach her and ask if she knows Luigi (Gigi) Briglia. She nods and asks us to follow her. I don’t remember her leaving, but I remember walking down a dirt pathway towards a beaming fluorescent light ahead of me, feeling like a transfixed moth. There, sitting below a drooping canopy, is a grey-bearded man in a black t-shirt, faded jeans, and sandals. There are two lawn chairs scattered in front of him. As we approach, he rises to greet us. As he smiles and reaches his hand out, I sense his kindness in the crinkles near his eyes. He asks us to sit down, offers his chair and moves the folded laundry off of mine, sweeping it clean from any dust. I look over to Anthony and let out a deep sigh of relief as he tells the man that his cousin, Claudia, sent us and starts to explain our blog, Made with Love. He listens intently before getting up and walking into his camper. I look over at Anthony and smile as I often do when things go better than expected. Luigi (Gigi) returns bearing a portfolio and three large manila envelopes. He hands one envelope to Anthony and one to me. I open the envelope and a stack of photographs falls onto my lap: black and white photographs of the city dating back 30 years, from before we were born. There are men stacking wood to make coal, women mouths wide-open, singing for glory, an old wrinkly grandmother pensively staring out of a window longing for the past, and a little Italian girl in her ballerina outfit stretching towards her toes. Incredible! These photographs are the most beautiful photographs I had ever seen. We spend the next hour thumbing through photo after photo of festivals, families, and traditions. We leave with one of his photography books and an invitation to return to his family’s home in the town of Caulonia Superiore during the day of Saint Hilarion (Sant’Ilarione) to make a recipe with his sisters, Manu and Dita. 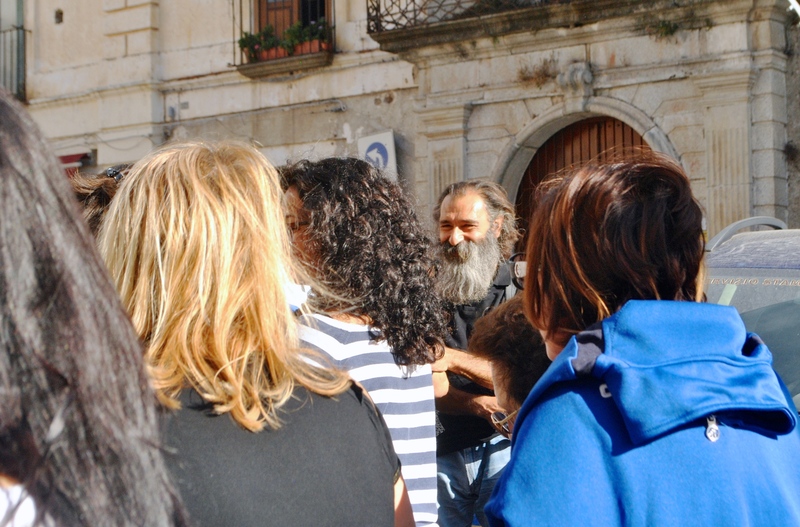 We meet Luigi at the corner of our street on the morning of the day of Saint Hilarion. 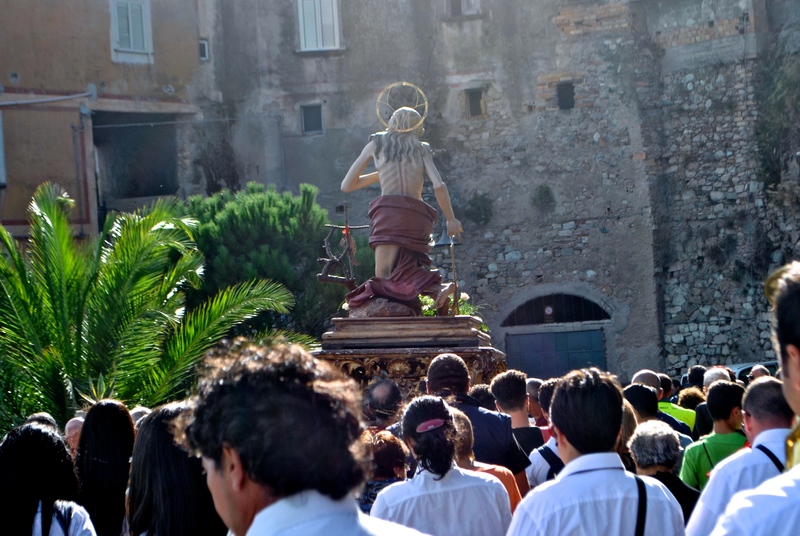 We hop in his car and drive the ten minutes to Caulonia Superiore, where the festival is being celebrated. 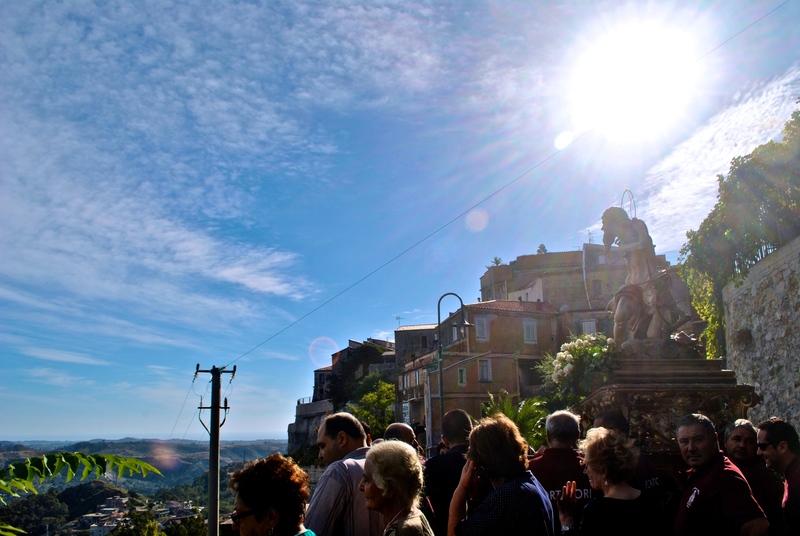 We arrive in the small town atop a hill and park the car, entering the piazza to see a large crowd of people gathering in front of the church. 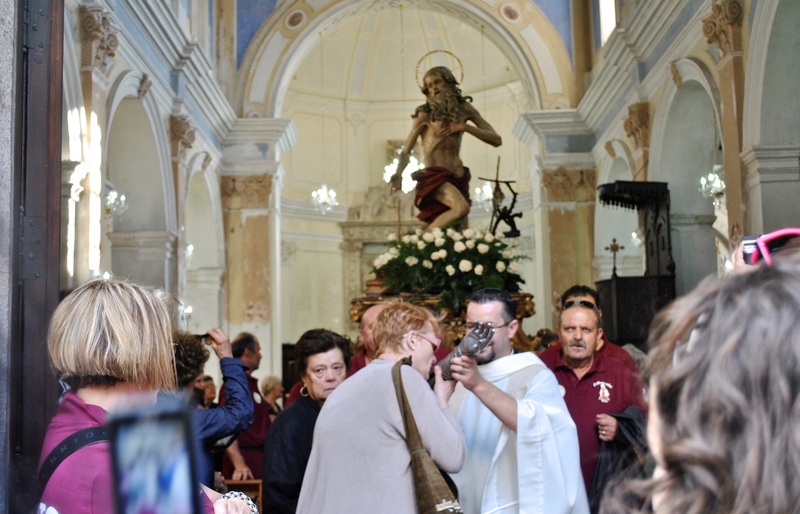 Luigi explains that everyone in the town gathers inside the church for Mass before embarking on a procession where the relic and statue of St. Hilarion are carried on the shoulders of 15 men. As the men bare the statue, they sing in unison with the community members to the sounds of the marching band that follows ensuite. 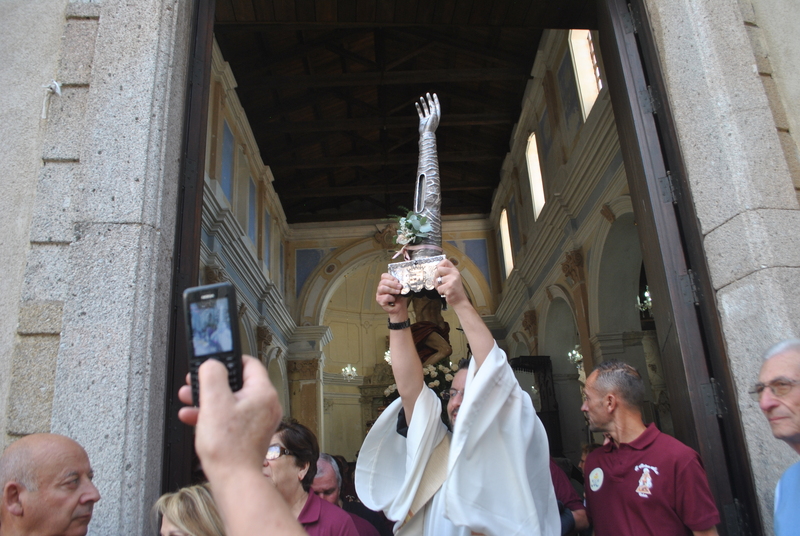 The priest carries a silver arm containing the ulna bone of St. Hilarion behind a transparent piece of glass, giving people his blessing while they kiss the holy relic. The procession stops right outside of the gates for 15 minutes as fireworks blast and the singing continues, before they begin their descent into the valley. The parade ends when they reach the abbey about 3 miles down the road. Everyone returns to town for an evening celebration full of good food, music, and joy. 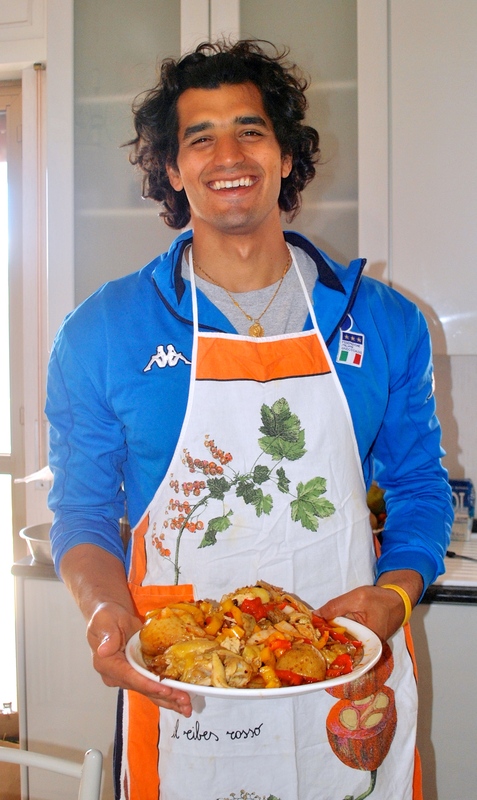 After the parade, Luigi invites us to his home to make Zeppole, Tarassaco e fagioli cannellini (wild chicory with cannellini beans), and homemade pasta con la buca (fusilli) with his sisters, Dina and Emanuela, (“Manu” for short). 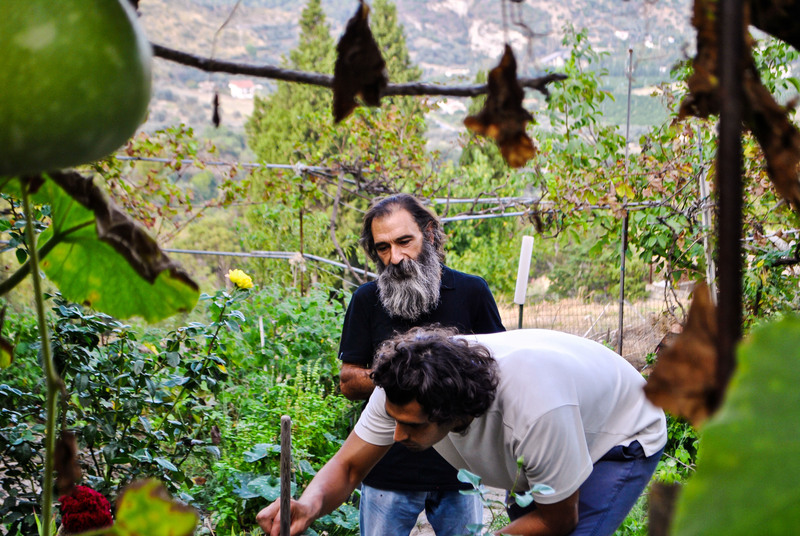 Everything Dina and Emanuela cook is organic: they harvest their own olives for olive oil, they forage their own wild plants, they have an incredible garden overlooking the fertile olive orchard and citrus fruit valley, they make their own soap, make their own pasta, and try to be as self-sufficient as possible. We laugh a lot, eat incredible food, and end our meal with a surprise dessert of lemon cake shaped in a heart by Manu! 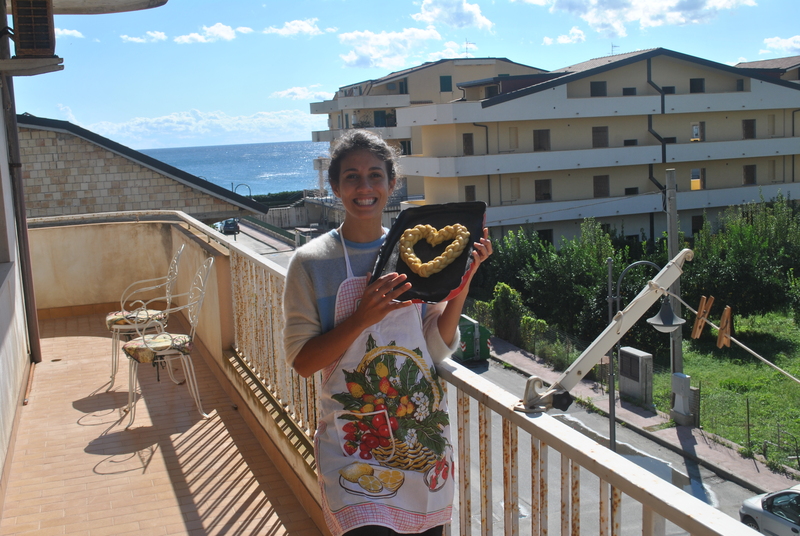 We leave feeling full, happy, and gracious that we are able to become friends with such inviting, loving people in Anthony’s nonna’s hometown. 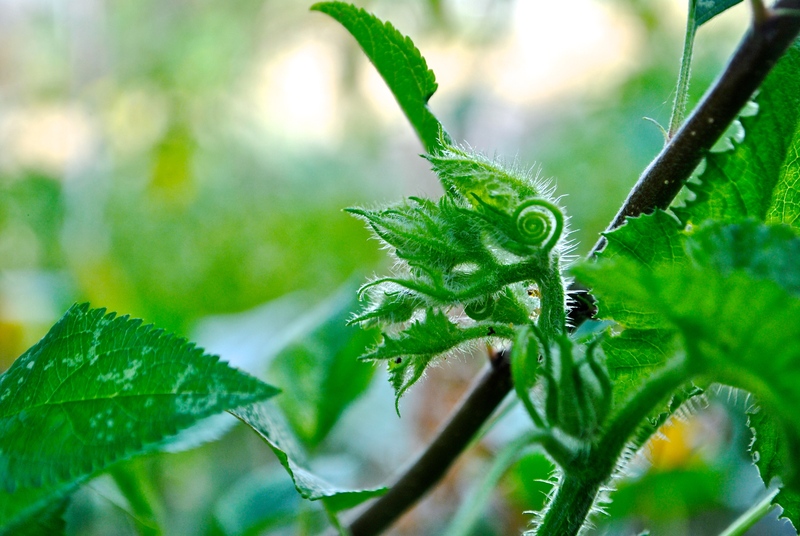 This blog post is courtesy of our NIAF Guest Bloggers, The Recipe Hunters – Anthony Morano and Leila Elamine. Learn all about them and their other adventures here! Image | This entry was posted in Blog, Culture, Italian, Italian American, Italy, NIAF, Travel, Uncategorized and tagged Blog, Calabria, Calabrian, Catholic Church, Catholic Tradition, Catholicism, Church, Fagioli, Feast, Feast Day, Food Blog, Food Bloggers, Fusilli, Guest Blog, Heritage, Holy Relic, Homemade, Homemade Pasta, Immigrant, Italian, Italian American, Italian culture, Italian Food, Italian Heritage, Italian History, Italian immigrants, Italian Tradition, Italy, National Italian American Foundation, NIAF, Olive, Olive grove, Olives, Pasta, Recipe, Recipes, Religious Feast, Saint Hilarion, Sant'Ilarione, The Recipe Hunters, Tradition, Zeppole. Bookmark the permalink.